Our story today begins in September as the Battle of the Somme enters its third month and while the fighting would continue all the way until November this would be the month of the last large British and French offensives in an attempt to break the German line. It would be a long hard month of fighting with smaller efforts scattered on either side of the main effort in the middle of the month. This middle battle would come to be called the Battle of Flers-Courcelette and it would see the use of tanks in warfare for the first time. Although they would not result in the great victory that was hoped for they would help the infantry to make some very reasonable gains. We begin today not with this large offensive, but instead at the village of Guillemont. The fighting over the village of Guillemont, which was located on the southern end of the British area of the front was seen as an essential stepping stone before the British could launch their next attack. The attacks on the village had been numerous up to this point, but they were going to give it another go because without its capture the next large attack would be blunted on its southern end. 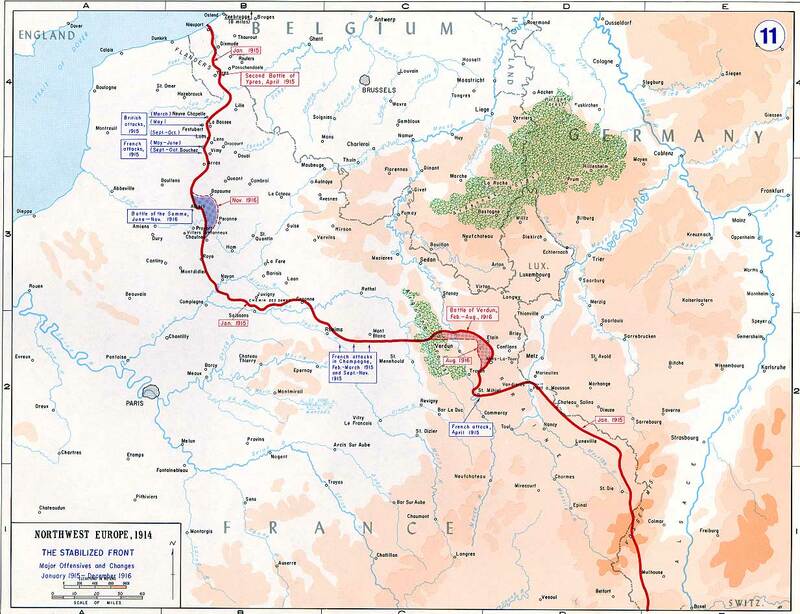 The Germans had already stopped every attack so far, and it was an important area for their men to hold onto. Villages like Guillemont are found all throughout the World War 1 story, small bits of ground that take on a psychological effect far greater than their tactical, strategic, or geographical effects. In this case the Germans had already lost so many men trying to hold onto the village that to eventually lose it would mean that all of that sacrifice had been wasted. On September 3rd this would come to pass. The British attack on that day would take the village, but not without one hell of a fight from the German defenders, who stuck to their positions almost to the last man. When the Germans were finally pushed out of the village and it came time to do a headcount for the various units some companies, which at full strength would number around 250 men were down to just 5 as was the case with the 5th Company 2nd Battalion Infantry Regiment 76. This was not even the worst hit unit with nobody surviving from the 3rd Company Fusilier Regiment 73. When it came time to write the regimental history for the 73rd, the official regimental historian Major Seiler chose an interesting solution to the problem of there being literally nobody to tell their story. On the page on which the 3rd Company report should have appears the simple statement "Nobody from 3rd Company can provide a report – all the men were killed, as was every officer. We honour these courageous comrades symbolically through this silent page, believing that that the simple ‘3./73’, is more eloquent than words…" In the same book of regimental histories there is a poem written by the father of a member of the 4th Company of that same Regiment. His name of Louis Engelbrecht and he was himself a retired soldier, in his poem he would say "To the Heroes of Guillemont; You men have saved the day; Your duty nobly done; Now you lie and take your rest in the dying rays of the sun; And over all the hills; Above the blood soaked sand; Soars like the breath of heaven; The thanks of the Fatherland;" A similar situation happened at Ginchy a week later, which was positioned to the East of Guillemont and was the next target on the British list. The men of the 16th Irish Division pushed through on September 9th and were able to consolidate their positions on the other side of the village. While these were two big successes there were other objectives that were not taken like those of High Wood, Wood trench, and Falfemont Farm. All of these, and several more, remained in the hands of the Germans and they would stay that way until the main attack on the 15th. The decision to allow this was made by the British commanders on September 9th when it was finally time to let everyone rest and prepare for the attack just a week later. The French would also be quite active in September, although generally not at exactly at the same time as the British. Foch was changing his tactics and he abandoned his previous attempts to have all of the French troops on the Somme attack simultaneously because he did not see a correlation between the managerial and supply problems this caused and increased successes on the battlefield. Because of this there would be several French attacks during September, but always by just one Army or one Corps. This made them large by normal standards, but small when compared to the larger efforts on this same front. The one on September 3rd would involve 10 divisions on a front 17 kilometers wide. This attack got off to a good start, and to the north of the river they were able to advance quite far, however it would eventually stall out after capturing some trenches and a few thousand prisoners. Their next attack would then be launched on September 12th, which was 3 days before the British attack. This time they attacked on both side of the river and the French 6th army was able to make some early advances, this went well enough that Foch notified the 2nd Cavalry Corps to prepare for possible action in case it was needed to exploit the attack. However, like all attacks, it slowly ground to a halt, even though most of the 6th Army's reserves were committed late in the day to try and get it moving again. Even with this success, the French attack would still end before the British attack on the 15th which meant that while the French were attacking the British were sitting in their trenches watching and while the British were attacking the French would be doing the same. I am not quite sure why this is, nothing in my research seems to have a clear answer other than the armies just not being well coordinated and not properly communicating delays to one another. The French would provide some artillery assistance on the 15th but that would be all. Thought the next month and a half, through the rest of September and October the French would launch multiple smaller attacks that resembled the British efforts from early September and they had roughly the same levels of results. Many of these managed to capture small bits of enemy territory but there was nothing truly remarkable that happened and generally it just resulted in small changes to where lines were drawn on a map. And now, we come to tanks, the moment you have all been waiting for. Whether or not tanks would be used in the September attacks was not a guaranteed thing until right before. In fact many British leaders were against using them entirely, or at the very least were quite pessimistic about how they would perform. Many have criticized the British leadership because they believe that 1916 was too early to use the tank and that if only they had waited and improved the designs and tactics a bit first then maybe they would have had a larger influence. There was a time that I would have agreed with that sentiment. However, as I have been researching for the podcast my thinking has been swayed. One quote I quite like on why my mind has been shifted comes from Brigadier General John Charteris who said essentially that the British could learn as much from one single use of the tank in battle than they could from a year of theorizing behind the front. I find this argument really persuasive, especially when you consider how long it sometimes took the British several battlefield lessons to learn certain lessons about how to properly utilize these large armored beasts. If they would have waited, they probably would have just delayed learning this valuable lessons and they just would have been forced to solve them later in the war. I think reliability is something that is often pointed to as one of the reasons that the tanks were released too early, and sure, their reliability sucked, but the British thought that they would be more reliable on the battlefield than they would be, without actually seeing how much more stress the tanks were put through on the battlefield maybe those reliability improvements are not made, and the Mark IV's and V's used in 1918 are not as reliable as they would end up being. In general when looking at history there is an easy mistake to make that if only Person X had been able to go from Point A to Point C without making the mistake that was Point B then everything would have been better. Often Point B, in this case the use of this new tool on the battlefield, is critical to finding out that there even is a Point C, and in which direction it was in. so, that is a pretty long discussion, but it is a topic that gets brought up a lot if you read about this area of history. The fact was that the tanks were going to be used and so lets talk about the effect they would have on the front. The first group to experience the tanks were actually the British infantry who did not have a great idea on what they were going to be working with when it came to the tanks. Here is Sergeant Harold Horne describing the experiences of his unit as they moved to the front in the days before the attack. "On our way up to the trenches we passed groups of large objects concealed under camouflage netting, but in the dark could not see what they were. Also we noticed that at intervals white tapes had been laid on the ground leading in the direction of the trenches. When we got into position we had the job of filling in the trench at each place where the tapes met it to provide a crossing place for the ‘tanks’. After we got into position, we were told that ‘tanks’, a kind of armoured vehicle, were coming up to lead the attack." During this attack the plan was for the tanks to move forward with the infantry, but because they were slower than the infantry they would start their advance slightly ahead of the men, which would put them at the German trenches about 5 minutes before the infantry. The really important bit of the plan though was that the artillery would leave lanes for the tanks to drive through, lanes that would be about 100 yards wide. This was both to leave the ground as intact as possible but also to allow the tanks to perform this early advance without getting destroyed by their own guns. These lanes would be highly visible both on the ground and in the air as this British airman explains "When we climbed up to the lines, we found the whole front seemingly covered with a layer of dirty cotton-wool-the smoking shell-bursts. Across this were dark lanes, drawn as it might be by a child's stubby finger in the dirty snow. Here no shells were falling. Through these lanes lumbered the tanks." These lanes pointed to some of the toughest German obstacles on the front, which each had tanks assigned to them for their capture. This was a decent plan, taking this new tool and giving it to the infantry units as a way to give them support against these tough objectives, there was just one tiny little problem, the tanks broke down, a lot. When this happened the infantry found itself completely alone trying to assault these positions that had not been touched by the creeping barrage, never a recipe for success. Not all of the tanks would fail to reach the German lines though, and when they got there the Germans were definitely surprised. In general the German command knew that the tank existed, or at least they knew that something called a tank existed and that it was some sort of armored vehicle, however they did not know any of the details. Even this scant bit of information was not known by all of the frontline units, and so needless to say men were quite surprised when this thing started rolling toward their positions, like this soldier of the 211th Infantry Regiment "There is a crocodile crawling into our lines!’ The poor wretch was off his head. He had seen a tank for the first time and had imagined this giant of a machine, rearing up and dipping down as it came, to be a monster. It presented a fantastic picture, this Colossus in the dawn light. One moment its front section would disappear into a crater, with the rear section still protruding, the next its yawning mouth would rear up out of the crater, to roll slowly forward with terrifying assurance." While caught off guard, the Germans were not helpless and they would manage to quickly come up with some countermeasures, which I think speaks highly of the ability of small German unit to improvise. A few tanks found their tracks destroyed by grenades placed in them by German soldiers who would creep right up to the tanks and some were disabled through the use of armor piercing ammunition that had been issued to the frontline units as a way of dealing with the metal shields that British snipers would sometimes use at the front. Both the improvised countermeasures and the problems of just getting the tanks forward would make for a rough day for the vehicles on the 15th. While the tanks take up a good portion of the story of the September 15th story, they were not the primary weapons for the British, that would still be a combination of artillery and infantry. For this attack there was an artillery piece for every 10 yards of front and a heavy gun for every 29, which makes for a concentration about double that saw on July 1st. These guns would support an attack of 10 divisions that would be facing half their number of German troops. On the far left of the attack the Canadians would make their Somme debut as part of General Gough's Reserve Army and they would push out from the recently captured town of Pozieres towards the village of Courcelette. Here they would do well in what was a very hard area of the line to attack, with the Germans in front of them putting up a fight and drenching their front with fire and also the fire from the Canadian left where the German front remained unengaged and therefore ready to assist. To the south the 47th division was able to finally and decisively capture High Wood and then move on to capture Starfish Trench, which is one of the funnier names for a battlefield position that I have seen, it just makes me smile every time I say it. These gains did come at a high price for the 47th though and the cost would be 4500 casualties over the course of just a few days of fighting. One Corporal of the 47th would write some words about his experiences on this day at the front "That day I saw sights which were passing strange to a man of peace. I saw men in their madness bayonet each other without mercy, without thought. I saw the hot life’s blood of German and Englishmen flow out together, and drench the fair soil of France. I saw men torn to fragments by the near explosion of bombs, and – worse than any sight – I heard the agonized cries and shrieks of men in mortal pain who were giving up their souls to their Maker. The mental picture painted through the medium of the eye may fade, but the cries of those poor, tortured and torn men I can never forget. They are with me always. I would I had been deaf at the time." To the south of the 47th the XIV Corps found themselves hard pressed to make any gains at and it would be here in front of Ginchy that the tanks would do worse than anywhere. Almost the entirety of the tanks assigned to this area of the front broke down or got stuck along the way to the front. In the rare cases that the tanks did get forward it was also here that they encountered the most coherent German response with a mixture of armor piercing rounds and other small arms fire disabling many tanks. It was also here that one of the biggest problems of the early tanks was clearly evident. When the tanks could get forward, which was far from a certainty, they were both too slow to keep up with the infantry when things were going well and also too slow to rush a point of resistance when things were going poorly. This meant that they were only super useful when things were going just okay, which is not something any military commander would ever strive for. One of the most famous of the actions for the tanks during this day happened in the village of Flers. It was here that the XV Corps attacked, with the New Zealand Division on the left, the 41st in the center and aiming for Flers itself, and then the 14th on the right. The New Zealanders did a fine job of moving forward right behind the artillery and this allowed them to hit the first German positions and then quickly move to the Switch line, and from there to the outlying trenches to the north of Flers itself. This was important because if the 41st had any hope of capturing the town the trenches to the north had to be neutralized. The men of the 41st also followed close behind their artillery and they also had at least one tank with them as they attacked into Flers. It was then around this time that an RFC pilot above the fighting glimpsed a tank moving into Flers, and he would send a message saying 'Tank seen in main street of Flers going on with large number of troops following it" Later this message would be slightly altered by the newspapers to result in a headline, in a classic case of slight exaggeration for effect it would read "A tank is walking up the High Street of Flers with the British Army cheering behind." For the tank in Flers the situation was very different than what the headline would portray. We are lucky enough to actually have a first-hand account from one of the men inside D-17 in the form of Second Lieutenant Stuart Hastie and he would discuss something of what it was like in D-17 while in the village "Having steered the engine by using the brakes up to this point, the engine was beginning to knock very badly and it looked as if we wouldn’t be fit to carry on very much further. We made our way up the main street, during which time my gunners had several shots at various people who were underneath the eaves or even in the windows of some of the cottages. We went on down through the High Street as far as the first right-angle bend. We turned there and the main road goes for a matter of 200–300 yards and then turns another right angle to the left and proceeds out through towards Gueudecourt. But we did not go past that point. At this point we had to make our minds up what to do. The engine was really in such a shocking condition that it was liable to let us down at any moment. So I had a look round, so far as it was possible to do that in the middle of a village being shelled at that time by both sides. I could see no signs of the British Army coming up behind me. So I slewed the tank round with great difficulty on the brakes and came back to Flers Trench and turned the tank again to face the Germans." It would not be long after this that D-17 had a track damaged which fully immobilized the tank and meant that the crew had to abandon it. The other tanks available to the troops around Flers did not move into the village itself but instead took up supporting positions to try and put its weapons to use to assist the attacking infantry. Overall, the attack on Flers was a success through a combination of support from the tanks and well timed infantry advances. One German evaluation of the attack from a Lieutenant Stephens of the German 17th Division would give 2 reasons for the successful attack 'the success of the British attack was due to two important factors: 1. the complete failure of the defensive barrage 2. the Extremely close co-operation between the enemy infantry and artillery, which was made possible by the remarkable achievements of their aviators"
The next stage of the battle would be called the Battle of Morval and unlike the attacks on the 15th it would be a smaller attack on a more concentrated area of the front. The big difference between this attack and the attacks in early September were that in this case the British were not saving men or ammunition for a later attack and because of this they were able to concentrate the material necessary to make progress. They set up a series of bite and hold attacks that would involve the British taking several jumps of a bit over 1000 yards, which would encompass the first trenchline and then they would stop while still under the protection of their artillery. A critical piece of this plan was a steady and consistent counterbattery program that allowed them to use aircraft to identify and then engage about a 1/3 of the total German artillery in the area. This allowed the infantry, who went over for the first time at noon on the 25th to move into the German lines that had been almost completely destroyed and freed them for a few more quick and easy successes without the usual strong artillery response. 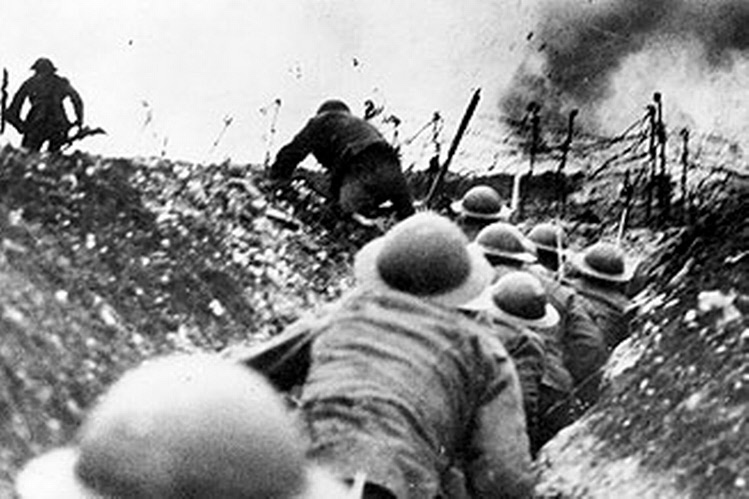 The one problem with these efforts was that it did not present any real chance of a short term victory on the Somme. Sure the British could advance a little way forward on a small front with some ease, but because this was slow it would always give the Germans the ability to just pull back and prepare a new line of positions that then the British would have to take another step to take. Really this could happen as many times as necessary for the Germans, especially at this point in the year when one of their primary concerns was preserving manpower. On the 26th of September a new operation began for the Reserve Army and this was the move against Thiepval Ridge which would come to be called the Battle of Thiepval. For those keeping track Thiepval Ridge was one of the original objectives on July 1st and this would be the first real attempt at recapturing those objectives since that date. The hope was that the Germans were too distracted by the Battle of Morval and all of the previous fighting had worn down their reserves enough to make it possible. They had a good amount of artillery and the attack was launched on a front of only 6,000 yards. Into this small area of the front were pushed 4 divisions including the 1st and 2nd Canadian. 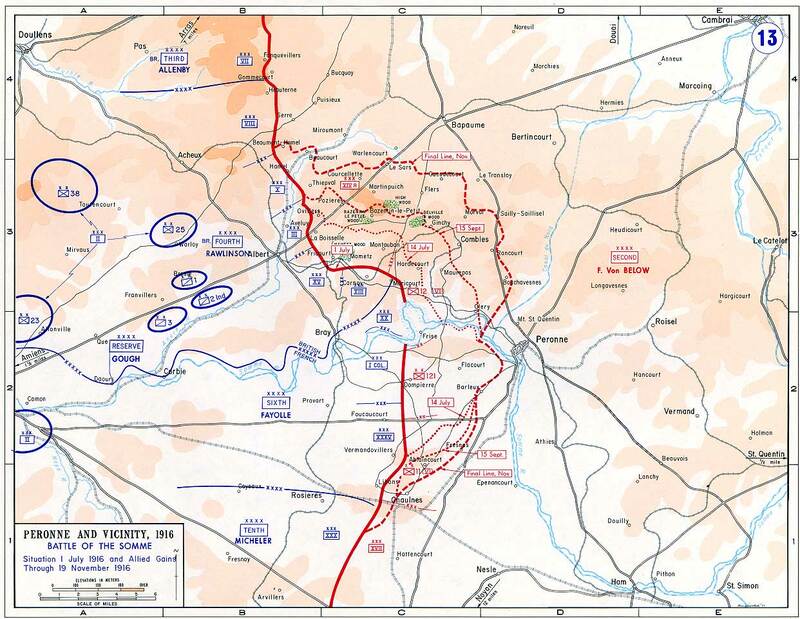 When they moved forward they were able to take the village of Thiepval on the first day but then after that things became disorganized and little additional objectives were captured. During this time the casualties were staggering, I do not remember numbers this high per division since July 1st with the Canadian 1st Divsiion losing over 6,000 men, This would not end the fighting in this area of the front, and we will be right back here in October to discuss the next action to attempt to take the same bit of objectives in the Battle of the Ancre Heights. Overall September was a costly month for both sides, with the British and French losing about 177,000 men and the Germans 140,000. This makes it the most costly month of the entire battle for the Germans, but a pretty large margin and the second most costly for the British and French, of course after the July disaster. The attacks on the 15th had strained the German defenses, and it was clear that the German generals did not have an adequate answer to the immediate problem of constant British and French attacks with their large artillery advantage. One of the biggest problems was that the German counterattacks had become too predictable and this allowed the artillery to lay fire at the right time and in the right place to neutralize these counterattacks. This need to evolve their defensive arrangements would be a constant problem for the German generals, and would be a continuing story until the end of the war. It did not help that they were so outnumbered in every regard at the Somme, not just the infantry were running out of men but also the artillery, especially with the increased focus on counterbattery fire as the battle wore on. Here is Gefreiter Konig of the Guards Field Artillery Regiment 347 “There were two of us left to serve the gun. These were Kanonier Böttcher, who was killed a few weeks later at Hyencourt, and me. My dear friend Böttcher passed the shells up to me, from a trench dug between the trails of the gun. I had to load, aim and fire. We kept this up for hours, giving it our very last reserves of strength. We were under extremely heavy fire the whole time. A hedgerow ran away to our right. All of a sudden, whilst we were engaged in heavy firing, I saw twenty to thirty Frenchmen run past us in their light blue coats. My first thought was that we had been overrun. We prepared for close quarter battle, but it was unnecessary; they were deserters. We carried on firing…" Unfortunately for all involved, all of that the men on the Somme had to look forward to in October was another month of fighting, which we will discuss next episode.